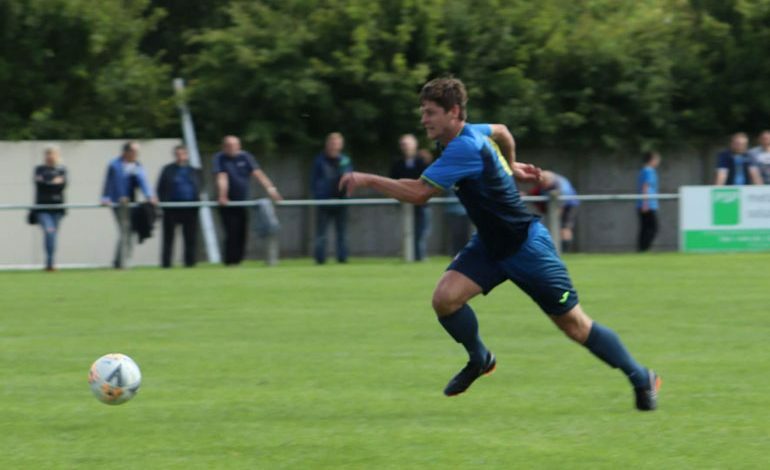 Newton Aycliffe took four points from their Bank Holiday derby games against Bishop Auckland and Shildon. On Saturday Newton Aycliffe won 1-0 at home to Bishop Auckland. The Bishops came into the game on a fine run of form. But it was Aycliffe who started well and exerted a lot of early pressure. Bishops keeper Liversedge dropped a couple of crosses, but no one was able to to turn in the loose ball. Bishops came into the game, and Hoganson hit a free kick from a good position straight at the wall. Richardson had a chance on 22 minutes for Bishops, but shot straight at James Winter in the Aycliffe goal. Aycliffe had the edge on the play though, and were rewarded when a cross from Aaron Brown (pictured above) wasn’t cleared by the Bishops defence, and Aaron Ramsbottom ran onto the loose ball and rifled it low into the net. Bishops had a good spell just before half time, but Winn and Patten were unable to trouble Winter with their efforts. Bishops came out of the blocks well in the second half, and had half chances from Winn and Johnson which missed the target. Aycliffe came through this spell, with man-of-the-match Tom Gavin putting in a strong performance at left-back against the Bishops attacks. Ramsbottom had a good chance to seal the points, but his lob over Liversedge went wide of the post. Aycliffe got back on top as a couple of substitutions introduced fresh legs. Daniel Kent and Alan Harrison went close with chances to finish the game. Bishops frustrations boiled over, with Winn being sent off late on, as Aycliffe took the three points. Bank Holiday Monday saw Aycliffe make the short trip to Shildon for their second derby of the weekend – and a crowd of 448 were treated to a six-goal thriller with the spoils shared. It looked as though it wasn’t going to be Aycliffe’s day when Alan Harrison put the ball into his own net on 12 minutes. James Winter got a hand to the ball but it was adjudged to have crossed the line. However, the visitors provided an immediate response when Tom Gavin equalised direct from a free-kick. On 19 minutes Aycliffe took the lead when Daniel Kent got a head to Harrison’s cross. The second half saw immediate pressure from Shildon and just on the hour substitute Billy Greulich-Smith equalised with a header. Two minutes later the home side took the lead through Aidan Haywood following a hotly disputed corner. On 77minutes Kurt Matthews came on as a substitute and within two minutes his low shot found the corner of the net bringing the score to 3-3. Shildon pressed hard for the final 10 minutes but Aycliffe held out for a well deserved draw. Next up for Aycliffe is another game against Bishop Auckland. This time in the Buildbase FA Vase at Heritage Park on Saturday (September 1, kick-off 3pm).